I do not write bad reviews. If I did not enjoy myself then I simply do not return. What do I have to say about Splendido? It’s perfect, you will have a great time and love the food. What do they serve? They say High Quality, Seasonal, Locally Sourced, Family Farmed Products that have been Traditionally prepared. The space is cozy, filled with a mix of couples, business people and some casual diners. Service was prompt with servers clearly having a mandate to ensure every customer’s needs are met. 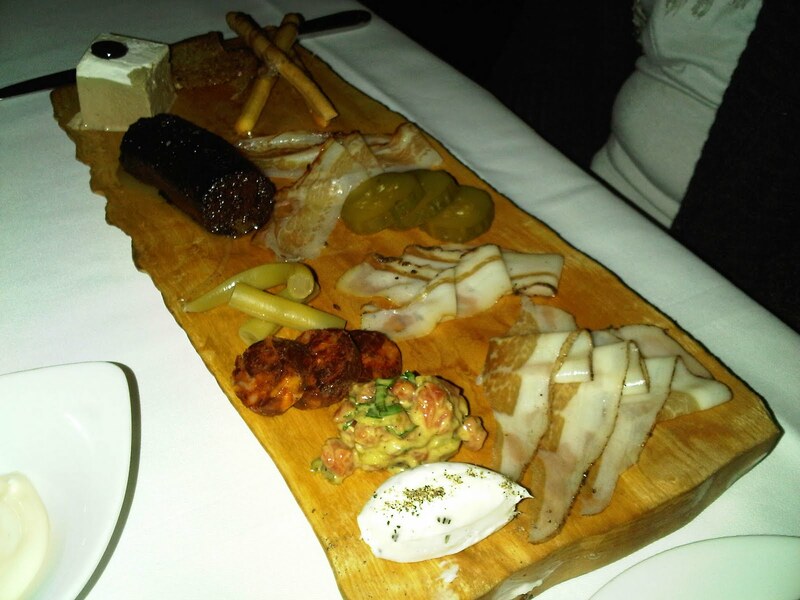 The table was set with a small bowl of olives and your choice of 6 house made breads. We asked for every type of bread as they all looked and smelled intoxicating. One of the olive types they had was brought from Italy then cured in house and had a citrus taste. It was so insanely good that I asked to buy a jar. So what did we eat? This is their Charcuterie platter and it was brilliant. Items bottom left to right. The White canelle was Berkshire Pork Fat to be used as a spread. This spread is what butter aspires to be, so decadent. House made avocado was good. Chorizo was spicy and packed with flavour. Spicy beans were, well, spicy! The blood sausage seemed firm but was softer then I have ever had it and worked well as a spread. 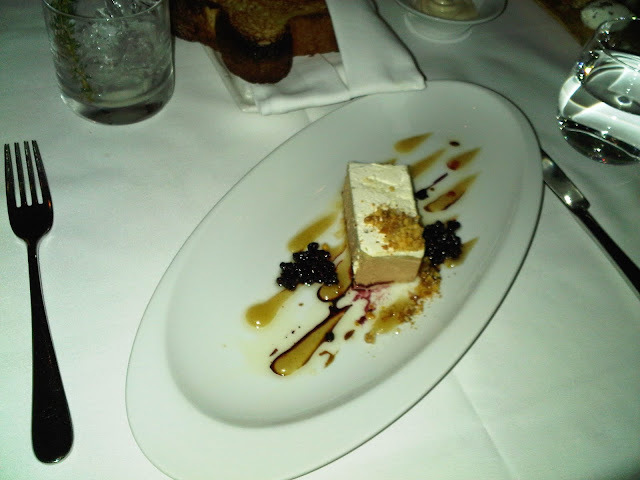 The square white topped item was a Foie Gras Turine with a perfect texture and a light taste. 2 Parmesan breadsticks were bursting with a nutty flavor. The most subtle prosciutto was next and I wish I had enough to wrap my body in it. Spicy pickles. Spicy salami and the last I cannot remember were also so buttery. Foie Gras Parfait with a Rhubarb Purée, Elderberries & Crushed Walnuts – $19. The parfait was served with a toasted brioche. Foie Gras in its many versions is many times served with fruits and in this case the tart elderberries and the sour rhubarb complimented the richness of the Foie Gras perfectly. This is one of the best dishes I have had this year. 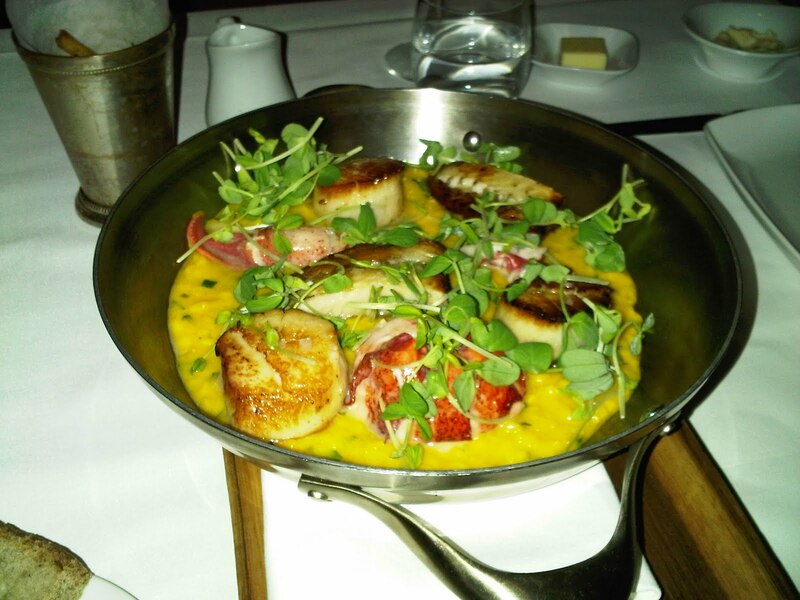 Scallop, Lobster and Black Cod on a bed of Saffron Risotto served in a Cataplan. It was one of their sharing plates and cost $36 each. The risotto was cooked perfectly with every grain discernible and the seafood, well forget about it. One note on the dedication to quality of this restaurant. One of the scallops had 3 or 4 hard white stones inside of it. This was clearly a natural phenomenon and not the fault of the restaurant. I mentioned this to the server and within minutes the chef came out to investigate. I showed him the pieces, he apologized and advised he would check with his suppliers. He went into the back and 5 minutes later as we were almost licking the Cataplan clean of every morsel, he advised he would not charge us for the dish. I might have paid double for that dish.